Let’s embark on a tour of Europe in Jerusalem, the hostels, churches, hospitals, and wealthy homes of cosmopolitan Jerusalem in the mid-19th century. A European style of tour will take us through the buildings and stories that the great powers brought to <?xml:namespace prefix = st1 ns = "urn:schemas-microsoft-com:office:smarttags" />Jerusalem. The 19th century brought new inventions and innovations to the world. Electricity, the steam engine, and even football were all invented during these years. The technological innovations reached the Middle East as well. Means of transportation improved, and Israel was connected to the world at large. During the 19th century, as the Ottoman Empire grew weaker, European powers began settling in the Holy Land, generating an upsurge of construction and development in Jerusalem. Each superpower sought a foothold in the city, and thus Russian, French, English, German, Italian, and other buildings were built. During this informative tour we will also learn how much Borscht costs in new Jerusalem, which French romantic built a hostel for one thousand pilgrims, and what befalls Jews in the Mission’s hospital. 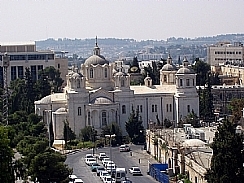 The sites of the tour include Jaffa Gate, Notre Dame de Jerusalem, the Russian Compound, and the Italian Hospital.